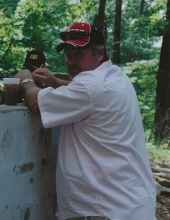 Ricky C. Smith, 59, of Leesville, passed away Tuesday, January 29, 2019. Funeral services will be held at 2:00 P.M. Friday, February 1, at Nazarene Church with Rev. Libby Newman officiating. Visitation will be held following the service at the church. Mr. Smith was born in Aiken, SC, son of the late M.C. Smith and Cleo Fulmer Smith. He loved fishing and hunting. Surviving are his wife, Judy Miller Smith; son and daughter-in-law, Ricky (Miriam) Carnell; step-son, Jerry Wyndham; daughter and son-in-law, Samantha (Travis) Parrish; grandchildren, Isabelle Smith, William Smith, Gavin Parrish; and sisters, Mickey Gooding and Vicky Smith. In lieu of flowers, memorials may be made to the Nazarene Church, 1420 Nazarene Road, Batesburg, SC 29006. To send flowers or a remembrance gift to the family of Ricky C Smith, please visit our Tribute Store. "Email Address" would like to share the life celebration of Ricky C Smith. Click on the "link" to go to share a favorite memory or leave a condolence message for the family.